For many years now I’ve asked my students to bring in a photograph (or a digital image) and write an entry in their Writer’s Notebooks using the image as a source of inspiration. I believe it’s very important for teachers of writing to model and demonstrate how writers craft pieces. This is my piece and the photograph that inspired it. My middle school was a lot different than this school. A LOT different! For one thing, it was called a “Jr. High” and it only had two grades in it…7th and 8th. It was a wild place. It was a scary place. It was nothing like LMS. 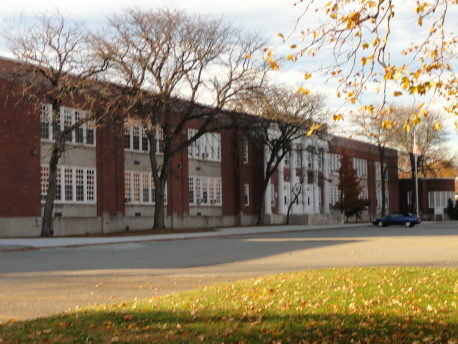 Herricks Jr. High was in an ancient building with horrible lighting. I distinctly remember some hallways being so dark you kinda wished you had brought a flashlight to school. It was especially hard to read the numbers on the lockers. Now that I look back, I realize that since the school was closing at the end of that year, the building was literally falling apart. Some classrooms had busted up windows and doors. My homeroom had lots of missing panels in the drop ceiling. Kids swore that something had died in the ceiling of our Spanish classroom. They said the custodians found a dead rat up there one day. The kids at Herricks Jr. High were very wild. I was not used to that at all. Most of the kids that went to my elementary school were well-behaved, but some of those other kids were CRAZY! Many 8th graders smoked in the bathrooms. They really did! You had to say, “It’s cool,” when you walked into the bathroom. The smokers wanted to be sure a teacher or principal wasn’t coming into the bathroom. If you didn’t, you would get beaten up. At least that was the rumor around school. I made sure to stay out of the bathrooms. In fact, I didn’t use the bathroom much in school that year and I remember sprinting home from the bus stop on many occasions. And not because I liked to run! I had a friend, Ken, who was so scared to use the bathrooms that he would pretend to be sick and go to the nurse’s office so he could use the private bathroom there. One kid smelled like weed all the time. He reeked! He would literally stink up the entire hallway he was walking in. I know because I smelled it on many occasions. Another kid had a cast on his arm and one day he decided to use the cast for destruction. He smashed his cast-encased arm into the glass display cases in our main hallway. I’m serious… he smashed EVERY single case. There was broken glass everywhere! I think he may have gotten expelled for that. I never did see him again after that. When you walked in the halls in my Jr. high you had to hold your books in your arms really tightly like the way a running back holds a football. “Booking” was a popular prank to play. Older kids would smash into your books with a hand or a fist, knocking the books from your arms in an explosion of papers and folders as you walked by unsuspectingly. Many “booked” victims had to spend countless minutes on their hands and knees picking up a mess of jumbled binders and papers. They were often late to class. It was not fun being “booked”! Believe me, I know from experience. Our principal was really weird too. His name was Mr. Lipman and he wore his pants really high…like Steve Erkel high…at least midway between his chest and his belly button. It was crazy to see in real life. He looked like an adult nerd. I’m not making this up! The teachers in my school were much older back then. One elderly sixth grade teacher, Mr. Flume, had a hearing aid. It didn’t always work well and kids used to mess with him by pretending to talk to him without actually speaking, just moving their lips. Mr. Flume would raise the volume on his hearing aid and then the kids would yell out and laugh while he held his ears in pain and quickly tried to lower the volume. My seventh-grade music teacher was so forgetful; she didn’t remember any of our names. We would pretend to be someone else in the class every other day and she never realized what was going on. This continued for the entire year! Another teacher even had a walker! This entry was posted in Uncategorized and tagged Education, Educators, Elementary school, Herricks, Herricks New York, Memoir, Middle school, Teacher, Writer's Notebook, Writing Journal. Bookmark the permalink.